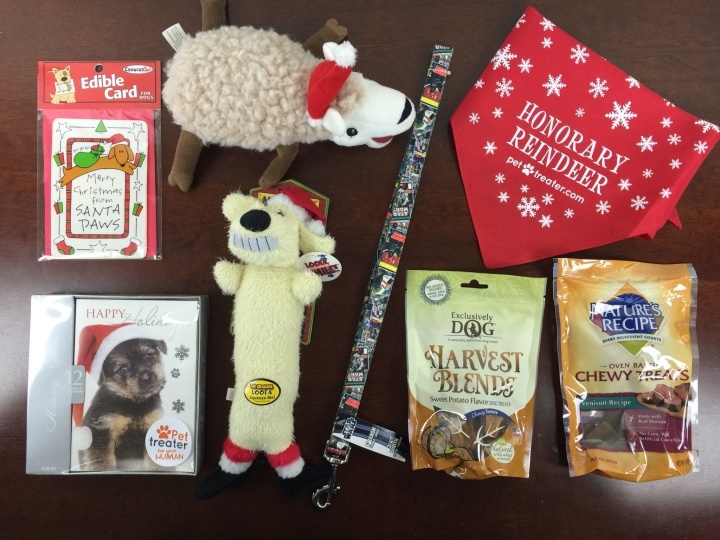 Pet Treater December 2015 Dog Subscription Box Review + Free Pet Bed Coupon! We received this box for our review.This post contains affiliate links! Pet Treater is a monthly subscription that provides high-quality treats and toys for your beloved canine. When you use the code provided below, the first box ships with a complimentary dog bed! Our pup took to the new bed pretty quickly. She was sleeping on it that evening. Even though she has a bed, we like having an extra bed around — the baby tends to nap in the dog’s bed, so it’s nice for her to have a spare! They also have a free dog vest deal, while supplies last. Use code PT-VESTSMALL (up to 25 lbs) or PT-VESTLARGE (61-130 lbs). The initial shipment comes in a giant box containing the decorative box and the bed. This is the decorative box to expect thereafter. Our box came with a personalized letter to our puppy. All the goodies in the box. Exclusively Dog Harvest Blends – Sweet Potato Flavor ($8.27) These chewy treats combine natural ingredients with real sweet potato, one of my dog’s favorite veggies. Nature’s Recipe Venison Recipe Chewy Treats ($8.99) Real venison is baked in. These are free from corn and wheat, common allergens. Lindy will love these too! There are safety concerns with rawhide — but I’m glad they made the exception in this case. The card is super cute; it’s made of thin rawhide and neatly printed with edible ink. There’s no need to actually feed it to your dog in order to enjoy this one. A set of 12 holiday cards with adorable puppy pictures is included as a special human treat. Honorary Reindeer scarf: Now your dog has something to wear to the party! This scarf is cute, and it is made big enough to fit most dogs (even with our 14 pound dog half the scarves aren’t big enough for her!). The material is very thin, though, so I wouldn’t anticipate using it for more than one season. Star Wars leash: What a great item, it’s inclusion timed perfectly to coincide with the excitement surrounding the release of the newest installment in the franchise. Fully functional and suitable for most dogs. The graphic is a montage of Star Wars comic book covers. Very cool! Multipet Loofa Dog Toy ($7.53) Made of an elongated loofa, this guy is shaped for carrying around and sports a santa cap and boots. Christmas Lamb Dog Toy: A plush lamb with a holiday hat. This guy is soft and meant for gentle nuzzling. These two had pretty expressive faces, even for dog toys. Along with our welcome letter, our dog was also provided a holiday survival guide to help her cope with the excitement of the season. This was a fun addition. I thought this card was so cute! We were impressed with this box. It had the toys and treats we expect to see in most of the pet boxes but it had a few surprises, too. The letter and postcard gave the box a bit of charm, and all the items were very nice. The holiday cards were a very wonderful addition for this month, and I thought the leash was extremely cool! Visit Pet Treater to subscribe or find out more! 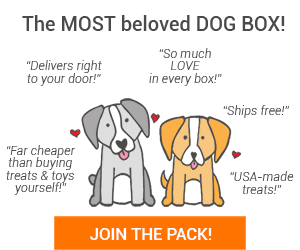 Get a free pet bed with your first box! Use coupon code PT-BED. If you want to grab the free vest instead, use code PT-VESTSMALL (up to 25 lbs) or PT-VESTLARGE (61-130 lbs). The Description: Pet Treater is a monthly dog treat, toy and accessory box. We pride ourselves on bringing incredible value and quality per month. Our members enjoy not only the convenience of new items every month, but actually saving money compared to buying the items themselves. Also, each box shipped results in a bag of treats, toy or accessory donated to a shelter in need. Feel free to reach out to us to suggest your local shelter to be included in this program.